Flank roundel on fascist-era Regia Aeronautica's aircraft. The Italian Royal Air Force (Regia Aeronautica Italiana) was the name of the air force of the Kingdom of Italy. It was established as a service independent of the Royal Italian Army from 1923 until 1946. In 1946, the monarchy was abolished and the Kingdom of Italy became the Italian Republic, whereupon the name of the air force changed to Aeronautica Militare. At the beginning of the twentieth century, Italy was at the forefront of aerial warfare: during the colonization of Libya in 1911, it made the first reconnaissance flight in history on 23 October, and the first ever bombing raid on 1 November. During World War I, the Italian Corpo Aeronautico Militare, then still part of the Regio Esercito (Royal Army), operated a mix of French fighters and locally-built bombers, notably the gigantic Caproni aircraft. The Regia Marina (Royal Navy) had its own air arm, operating locally-built flying boats. The Italian air force became an independent service—the Regia Aeronautica—on March 28, 1923. Benito Mussolini's fascist regime turned it into an impressive propaganda machine, with its aircraft, featuring the Italian flag colors across the full span of the undersides of the wings, making numerous record-breaking flights. Between 1 April 1939 and 1 November 1939, Italian airmen established no fewer than 110 records, winning world championships in round trips, long-range flights, high speed and altitude flights. Possibly the most brilliant successes were the floatplane's world speed record of 709 km/h (440.6 mph) achieved by Francesco Agello on the Macchi-Castoldi MC-72 in October 1934  and the long-range formation flight to the USA and back to Italy in 1933, a total of 19,000 km (11,800 miles) on Savoia-Marchetti S.55 flying boats. This pioneering achievement was organized and led by General of Aviation Italo Balbo. During the latter half of the 1930s, the Regia Aeronautica participated in the Spanish Civil War, as well as the invasions of Ethiopia and Albania. The first test for the new Italian Royal Air force came in October 1935, with the Ethiopian war. During the final stages of the war, Regia Aeronautica deployed up to 386 aircraft, operating from Eritrea and Somalia. The Italian aviators did not have any opposition in the air, as the Imperial Ethiopian Air Force had just 15 transport and liaison aircraft, only nine of which were serviceable. However the Regia Aeronautica lost 72 planes and 122 aircrew members  while supporting the operations of the Regio Esercito, sometimes dropping poison gas bombs against the Ethiopian army. And after the end of hostilities, on 5 May 1936, for the following 13 months the Regia Aeronautica had to assist Italian forces in fighting Ethiopian guerrillas. During the Spanish Civil War Italian pilots fought alongside Spanish Nationalist and German Luftwaffe pilots as members of the Aviazione Legionaria ("Aviation Legion"). This deployment took place from July 1936 to March 1939 and complemented an expeditionary force of Italian ground troops titled "Corps of Volunteer Troops". In Spain, the Italian pilots were under direct command of the Spanish Nationalists and took part in training and joint operations with the pilots of the German "Condor Legion". Mussolini sent to Spain 6,000 aviation personnel as well as about 720 aircraft, including 100 Savoia Marchetti SM.79 bombers and 380–400 Fiat CR.32 biplanes that dominated the air, proving superior to the Soviet Polikarpovs of Republican Air Force. The Aviazione legionaria achieved approximately 500 air victories, losing 86 aircraft in air combat and about 200 flying personnel. But more important than the material losses were the wrong conclusions from air war in Spain. The Air Ministry, blinded by the success of the Fiat CR.32, persisted in its belief that the biplane could still dominate the sky in the following years, and ordered large production of Fiat CR.42, the last war biplane in history. The Regia Aeronautica played a limited role during the Italian invasion of Albania. In July 1939, the Regia Aeronautica was seen as splendid air arm, holding no fewer than 33 world records, three times more than USA (that held 11), much more than Germany (15), France (12), Soviet Union (7), Japan (3), United Kingdom (2) and Czechoslovakya(1). When World War II began in 1939, Italy had a paper strength of 3,296 machines. While numerically still a force to be reckoned with, it was hampered by the local aircraft industry which was using obsolete production methods. Actually, only 2,000 aircraft were fit for operations, of which just 166 were modern fighters 89 Fiat G.50 and 77 Macchi MC.200, both type slower than potential opponents as the Hawker Hurricane, the Supermarine Spitfire and the Dewoitine D.520. Still, Regia Aeronautica had not long-range fighters nor night fighters. Technical assistance provided by its German ally did little to improve the situation. On 10 June 1940, during the closing days of the Battle of France, Italy declared war on France and the United Kingdom. On 13 June, Fiat CR.42s attacked French air bases and escorted Fiat BR.20s that bombed the harbour of Toulon. Two days later, CR.42s from 3° Stormo and 53° Stormo attacked again French Air Force bases and clashed with Dewoitine D.520s and Bloch MB.152s, claiming eight kills for five losses. 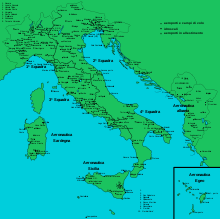 But when on 15 June, a French small fleet shelled the Ligurian coast, the Italian air force was not able to prevent this action or to attack the French ships effectively, showing a lack of cooperation with the Regia Marina, Italian navy. The Regia Aeronautica carried out 716 bombing missions in support of the Italian invasion of France by the Regio Esercito. Italian aircraft dropped a total of 276 tons of bombs. Generale Giuseppe Santoro in his book published after the war criticized such unplanned use for the Air Force, which had not been prepared for operations against fortifications which were immune to aerial bombing. Only about 80 long tons (81 t) of bombs were dropped on the targets, with little effect. During this short war, Regia Aeronautica lost 10 aircraft in aerial combat and 24 aircrew personnel, while claiming 10 kills and 40 French planes destroyed on the ground. After the war, there was a widespread rumour in France, especially between Paris and Bordeaux, of Italian aircraft strafing civilian columns, with many people claiming to have seen the tricolour roundels painted on them. Allegations of Italian aircraft attacking civilians have been disproved, as the Italian aircraft did not have the range to hit such distant targets and concentrated on short-range military objectives (Regia Aeronautica wing roundels had three fasci littori, having replaced the tricolour ones). It was concluded that this was nothing more of a myth, arising from the reaction to the Italian attack, the fame of the Italian air force and the heated and confused climate. Regia Aeronautica aircraft were involved in the Middle East almost from the start of Italian involvement in World War II. During the Anglo-Iraqi War, German and Italian aircraft of "Flyer Command Iraq" (Fliegerführer Irak) stopped to refuel in the Vichy French-controlled Mandate of Syria as they flew to Iraq. These masqueraded as Iraqi aircraft and were painted as such en route. Continued concern over German and Italian influence in the area led to the Allies' Syria-Lebanon Campaign. 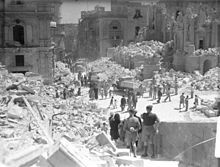 In one of the lesser known incidents of the war, starting in July 1940, Italian aircraft bombed cities in the British Mandate of Palestine. This was to push the British back and retake the greater Mediterranean as was in Roman times. 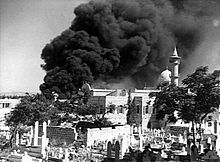 The bombing of Tel Aviv on September 10, killed 137 people. In mid-October, the Italians also bombed American-operated oil refineries in the British Protectorate of Bahrain. In Italian East Africa the Regia Aeronautica performed better than in other war theaters. ln June 1940, the Italian Royal Air Force had here 195 fighters, bombers and reconnaissance aircraft, plus 25 transport planes. Some of these aircraft were outdated, but the Italians had Savoia-Marchetti SM.79 (12 examples) and Savoia-Marchetti SM.81 bombers and Fiat CR.42 fighters. In relative terms, these were some of the best aircraft on hand to either side at the beginning of the East African Campaign. In addition, the Italian aircraft were often based at better airfields than those of the British and Commonwealth forces. When the war began, Italian pilots were relatively well trained and confident of their abilities. At the beginning of the hostilities, Regia Aeronautica achieved aerial superiority and occasionally skilled Italian pilots, flying their Fiat biplanes, managed to shot down even the faster and better armed Hawker Hurricane monoplanes. However, during the first three months, Regia Aeronautica lost 84 aircraft and had 143 aircrew personnel killed and 71 wounded, but the losses did not halt Italian operations. Cut off from Italy as they were though, problems with lack of fuel, munitions, spare parts and replacements became a serious problem and the Regia Aeronautica was worn down in a war of attrition. By 31 January, Prince Amedeo, Duke of Aosta, reported that the Italian military forces in East Africa were down to 67 operational aircraft with limited fuel. By the end of February, the Regia Aeronautica had only 42 aircraft left in East Africa, and the British now had the upper hand. In March, surplus personnel of air force units had to fight as infantry. By the end of the following month, Italians had only 13 serviceable aircraft left in East Africa. At last, on 24 October 1941, about one month prior to the final Italian surrender, the last Italian aircraft of the campaign, a Fiat CR.42, was shot down. On 10 September 1940, an independent air corps for supporting Luftwaffe in the Battle of Britain was established. It was named Corpo Aereo Italiano, or CAI. It was under command of Generale Rino Corso Fougier. It comprised approximately 170 aircraft  including 80 Fiat Br.20 bombers and 98 Fiat G.50 and CR.42 fighters. The transfer of the planes was completed by 19 October. The CAI was based in occupied Belgium. Bad weather and planes inadequate to that war theater hindered effective action by the CAI. The CR.42s clashed with British Hawker Hurricanes and Supermarine Spitfires just two times, in November. The Italians claimed five victories and nine probables, but five Fiat biplanes were shot down. The RAF, however, reported no losses. The 17 bombing raids carried out by the BR.20s did not cause much material damage, moreover aircraft were needed on the Greek front and in Cyrenaica  so in January 1941 the bombers and CR.42s started to be withdrawn to Italy. Just two squadrons of G.50s remained until mid-April 1941. During this campaign, Regia Aeronautica lost 36 planes, (including 26 in accidents) and 43 aircrew personnel, without achieving a single confirmed air victory. Initially, the Western Desert Campaign was a near equal struggle between the Regia Aeronautica and the British Royal Air Force (RAF). Early on, the fighters available to both sides were primarily older biplanes with Italian Fiat CR.32 and Fiat CR.42s flying against British Gloster Gladiators. After the Italian disasters during Operation Compass and the arrival of General Erwin Rommel and his German Africa Corps, the Regia Aeronautica in the Western Desert fought side by side on the German Luftwaffe. Although the air campaign in Libya was seriously limited because of desert conditions, the Italian Royal Air Force managed to retain a force of nearly four hundred airplanes. During the first British counter-offensive, the Regia Aeronautica had suffered heavy losses (over 400 aircraft) until the Axis attack on Greece began, when a major part of the British land and air forces were diverted there giving the Italian forces time to recover. New Italian aircraft and units were supplemented by the arrival of the German Afrika Corps, and the attached Luftwaffe contingent deployed almost 200 airplanes in Libya and another 600 in Sicily. Working with the Luftwaffe, the Regia Aeronautica performed better due to the exchange of tactical doctrine and the arrival of more modern aircraft. In mid-1942, during the Battle of Bir Hakeim (26 May 1942 – 11 June 1942) the new fighter Macchi C.202 outperformed all Desert Air Force's fighters, achieving an unprecedented ratio kill/loss of 4,4/1, better than that of famed Messerschmitt Bf 109s (3,5/1) fighting the same battle. During Rommel's first offensive, the Italians managed to divert RAF attacks from Rommel's forces and covered Rommel's retreat during the British Operation Crusader while inflicting heavy losses on RAF bombers. During Rommel's second offensive the Regia Aeronautica and the Luftwaffe suffered considerable losses due to stronger Allied resistance during the air battles over El Alamein and the bombing raids over Alexandria and Cairo. The Regia Aeronautica, having suffered heavy losses in Egypt, was withdrawn progressively to Tobruk, Benghazi, Tripoli and, eventually, Tunisia. The Regia Aeronautica participated in the air offensive on the British controlled island of Malta along with the German Air Force in an attempt to gain control of the Axis sea routes from Sicily, Sardinia, and Italy to North Africa. Up to the end of 1940, the Regia Aeronautica carried out 7 410 sorties against the island, dropping 550 tons of bombs, losing 35 aircraft. The Italians claimed 66 British planes, in these first six months of combact. But these claims were exaggerated. In 1941, Regia Aeronautica carried out further attacks on Malta, but less intensely than in 1940. The Italian airmen started to fear Maltese fighters and AA artillery, so much that the flight to the besieged island became known as the rotta della morte, the "route of death". In 1942, for its operations against Malta, between 1 January and 8 November, Regia Aeronautica had to write off 100 more aircraft lost in action. Malta suffered heavy losses too, and was to the edge of starvation. However the besieged island managed to withstand the attacks from the Italian and German air forces and claimed almost 1,500 Axis planes. The last raids on Gibraltar were done during the 1943 Allied landing in Algeria, when those bombers also made a successful strike on the port of Oran. The only unit of the Regia Aeronautica to fly the Piaggio P.108 was the "274th Long-Range Bombardment Group" which was formed in May 1941 as the first machines came off the assembly lines. Training and achieving full operation strength took far longer than anticipated and the 274th only became operational in June 1942. When, on 28 October 1940, the Greco-Italian War started, Regia Aeronautica fielded 193 combat aircraft which initially failed to achieve air superiority against the Royal Hellenic Air Force, RHAF, that had 128 operational aircraft out of a total of 158. The poor infrastructure in Albania air bases hindered communications and movements between the Italian flying units. Only two airfields – Tirana and Valona – had macadam runways so autumn and winter weather made operations more difficult. There was also the usual lack of co-operation with the Italian Navy and Army. Finally, just few days after the start of the war, Italian pilots were confronted by No. 80 Squadron, led by the outstanding ace Marmaduke Pattle and equipped with Gloster Gladiators, by No. 30 Squadron, No. 211 Squadron and No. 84 Squadron with Bristol Blenheims and No. 70 Squadron with Vickers Wellingtons. Gradually, Italian air power (including Squadriglie flying from Italian air bases) grew to over 400 aircraft against the dwindling numbers of the Greeks. However, this advantage did not stop the Hellenic Army from forcing the Regio Esercito onto the defensive and back into Albania. In early 1941, the tide was turned as the German Wehrmacht launched its simultaneous invasion of Yugoslavia and of Greece. For the 11 days campaign against Yugoslavia, Regia Aeronautica deployed 600 aircraft, claiming five air victories (plus 100 planes destroyed on the ground) and suffering five losses. However, from that point on, the role of the Regia Aeronautica in the Balkans Campaign was primarily that of support to the Luftwaffe. This support role continued during the occupation of Greece and the occupation of Yugoslavia that followed. Regia Aeronautica claimed 218 aircraft shot down plus 55 probables against the RHAF and RAF, while the Greeks claimed 68 air victories (plus 23 probables) and the British 150 kills. Actually the air war against Greece cost the Italians just 65 losses (but 495 damaged) while RAF losses in the Greek campaign were 209 aircraft, 72 in the air, 55 on the ground and 82 destroyed or abandoned during the evacuation. In August 1941 the Regia Aeronautica sent an Air Corps of 1,900 personnel to the Eastern Front as an attachment to the "Italian Expeditionary Corps in Russia" (Corpo di Spedizione Italiano in Russia, or CSIR) and then the "Italian Army in Russia" (Armata Italiana in Russia, or ARMIR) were known as the "Italian Air Force Expeditionary Corps in Russia" (Corpo Aereo Spedizione in Russia). These squadrons, initially consisting of 22° Gruppo CT with 51 Macchi C.200 fighters and 61° Gruppo with the Caproni Ca.311 bomber, supported the Italian armed forces from 1941 to 1943. They were initially based in the Ukraine and ultimately supported operations in the Stalingrad area. In mid 1942 the more modern Macchi C. 202 was introduced to operations in Russia. The CSIR was subsumed by the ARMIR in 1942 and the ARMIR was disbanded in early 1943 after disaster during the Battle of Stalingrad. The Air Corps pulled out of operations in January 1943, transferring to Odessa. From 1944 to 1945, Italian personnel operated from the Baltic area and in the northern part of the Eastern Front under the direct command of the Luftwaffe under the name Air Transport Group 1 (Italian: 1° Gruppo Aerotrasporti "Terracciano" , German: 1° Staffel Transportfliegergruppe 10 (Ital)). This group was part of the National Republican Air Force of the Italian Social Republic. The Regia Aeronautica was put in a defensive role during the Sicilian Campaign. Italian pilots were constantly fighting against Allied efforts to sink Regia Marina ships. Just before the Allied invasion, a huge Allied bomber offensive struck the airfields in Sicily in an effort to gain further air superiority. This left the Regia Aeronautica very weak, but still alive as aircraft continued to arrive from Sardinia, southern Italy, and southern France. The last mission of the Regia Aeronautica before the truce with the allies was the defence during the (USAAF) bombing on Frascati—Rome on September 8, 1943. After the Italian armistice, the Regia Aeronautica was briefly followed by two new Italian air forces. Headquartered at Salerno, in southern Italy, the Royalist Italian Co-Belligerent Air Force (Aviazione Cobelligerante Italiana, or ACI) fought alongside the Allied forces. In northern Italy, the National Republican Air Force (Aeronautica Nazionale Repubblicana, or ANR) flew for the Italian Social Republic and the Axis. The first ANR fighter unit was the 101st Gruppo Autonomo Caccia Terrestre, based in Florence. Aircraft of the Royal and Republican air forces never fought each other. The ACI operated in the Balkans and the ANR operated in northern Italy and the area around the Baltic Sea. From 10 June 1940 up to 8 September 1943, the Regia Aeronautica lost 6,483 aircraft  (other sources report 5,201 ), including 3,483 fighters, 2,273 bombers, torpedo-bombers and transports, plus 227 reconnaissance planes. The Royal Italian Air Force itself claimed 4,293 enemy aircraft, including 1.771 destroyed on the ground. Personnel losses suffered during the conflict consisted of 3,007 dead or missing, 2,731 wounded and 9,873 prisoners of war. The Regia Aeronautica tended not to keep statistics on the individual level, instead reporting kills for a certain unit, attributed to their unit commander. However, pilots were able to keep personal log books, so the few that survived through World War II give individual statistics. Here is a list of the aces attributed with ten or more kills. The Regia Aeronautica was succeeded by Aeronautica Militare when Italy became a republic on 2 June 1946. ^ Neulen 2000, p. 19. ^ Neulen 2000, p. 20. ^ Neulen 2000, p. 22. ^ Neulen 2000, pp. 22–23. ^ Neulen 2000, p. 23. ^ Neulen 2000, p. 26. ^ Neulen 2000, p. 29. ^ a b Neulen 2000, p. 30. ^ a b Cattaneo 1971, p. 5. ^ a b c d Neulen 2000, p. 32. ^ Rochat, Giorgio. "La campagne italienne de juin 1940 dans les Alpes occidentales". Revue historique des armées. Retrieved 14 December 2014. ^ Neulen 2000, p. 39. ^ Neulen 2000, p. 40. ^ Neulen 2000, p. 44. ^ Neulen 2000, p. 35. ^ a b Neulen 2000, p. 36. ^ Harvey 1993, p. 607. ^ De Marchi 1976, pp. 6–7. ^ Green & Swanborough 1982, p. 310. ^ Palermo 2014, p. 222. ^ Palermo 2014, pp. 255–264. ^ Greene & Massignani 2002, p. 235. ^ Carr 2012, p. 171. ^ a b Neulen 2000, p. 75. ^ Massimelo-Apostolo 2000, p. 86. Apostolo, Giorgio (2000). Italian Aces of World War II. Botley, Kent: Osprey. ISBN 1-84176-078-1. De Marchi, Italo (1976). Fiat BR.20 Cicogna. Le macchine e la storia. Modena: Editore S.T.E.M. Mucchi. OCLC 731413518. Green, William; Swanborough, Gordon, eds. (June 1982). "Fiat BR.20... Stork à la mode". Air International. 22 (6): 290–294, 307–312. ISSN 0306-5634. Harvey, Arnold D. (1993). Collision of Empires: Britain in Three World Wars 1793–1945. London: Hambledon Press. ISBN 1-85285-078-7. Shores, Christopher (1976). Regia Aeronautica: A Pictorial History of the Italian Air Force, 1940–1943. Warren, Michigan: Squadron/Signal. OCLC 3089044. Brookes, Andrew (2000). Air War Over Italy: 1943–1945. Hersham, UK: Ian Allan. ISBN 978-0-71102-690-2. Cattaneo, Gianni (1971). Fiat CR.42. Modena: Editore S.T.E.M. Mucchi. Dunning, Chris (2009). Courage Alone: The Italian Air Force 1940–1943 (rev. ed.). Hikoki. ISBN 978-1902109091. Dunning, Chris (2009). Regia Aeronautica: The Italian Air Force 1923–1945 – An Operational History. Hersham, UK: Classic Publications (Ian Allan). ISBN 978-1-906537-02-9. Shores, Christopher; Massimello, Giovanni; Guest, Russell (2012). A History of the Mediterranean Air War, 1940–1945: North Africa, June 1940 – January 1942. 1 (1st ed.). Philadelphia, PA: Casemate. ISBN 978-1-90811-707-6. Shores, Christopher; Massimello, Giovanni; Guest, Russell (2014). A History of the Mediterranean Air War 1940–1945: North African Desert, February 1942 – March 1943. 2. London: Grub Street. ISBN 978-1-90916-612-7. Terrain, John (1997). The Right of the Line. London: Hodder and Stoughton. ISBN 1-85326-683-3.